Use this condiment organizer to provide heaps of items in limited space! The condiment packet display makes it easy to organise your breakroom, cafe, restaurant, or buffet by placing condiment packets, coffee accessories, and more all in one convenient location. The container is made from black textured ABS plastic, a durable material that looks great and is also low-cost to work within any business budget! The display is 400 x 470 x 220mm, taking up little counter space considering the amount of items that can be displayed. The condiment organizer, one of our many offered hospitality supplies, makes it easy to provide many items in one location. 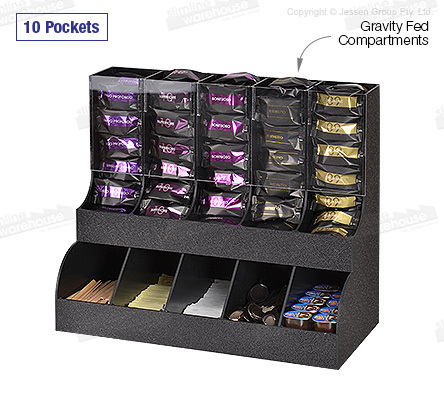 This display has (10) individual pockets for holding items in different sizes. The bottom row can hold some plasticware, longer items and other similar items. The top row has a design more like a dispenser, with a clear acrylic front to make it easy to recognise what is in each pocket. Order any of our restaurant displays today by 2pm EST for same day despatch to anywhere in Australia when in stock!